The last day of Kepler Track, and I’m heading for Rainbow Reach, just a couple of hours away, in order to catch the shuttle bus back into Te Anau (where the hot showers are, and I can’t wait). It’s more beech forest on the way out to Rainbow Reach – not that I’m complaining, mind you – and also some wetlands, with a boardwalk over 5 metres of moss, which was pretty cool. It was an interesting change of pace scenery-wise. Just over an hour later, I came to Rainbow Reach, and the big swing bridge there. I love those things – like suspension bridges, but when you jump on them (and I always do) they swing and bounce. They make some people quite nervous, but I’ve liked them ever since I was a kid – just what you’re used to, I guess. A quick ride into town later, and I was done with Kepler. I enjoyed it, but parts were bloody hard work. I don’t remember Milford Track being this tough, though maybe I’m more unfit now than I was then. 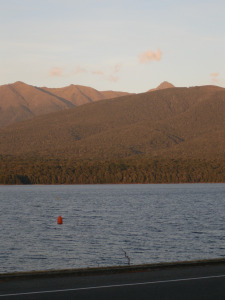 Either way, it was a little bit of a shock to look up at Mount Luxmore from Lake Te Anau (it’s that triangle peeking up from behind the hills) and realise that it looks a lot shorter from down here… it didn’t feel short climbing up it!